The Real Estate in this part of Albuquerque is primarily made up of traditional suburban neighborhoods including the Princess Jeanne neighborhood. Homes and subdivisions in this area started being built during the Albuquerque, NM Real Estate boom of the 1950s. In general the homes in this area are on residential size lots and are a more traditional style, similar to what you would see in other parts of the country in planned developments of this era. Still, you will see a good amount southwest style these Albuquerque homes. Since many of these neighborhoods are more established, you will find that the landscaping is more mature than the newer neighborhoods around Albuquerque and New Mexico. The parks have large trees and nice shady spots. One notable neighborhood here is the Princess Jeanne Park neighborhood. In 1954, Dale Bellamah’s 1600-home Princess Jeanne Park, named for his wife, was built between Lomas and Indian School from Eubank to Juan Tabo. Princess Jeanne offered “wife-planned” homes with fireplaces, spacious patios and such new products as Linoleum, Formica, and Pulverator disposals. I was surprised once to run across a Princess Jeanne display at the Smithsonian in Washington, DC. The Princess Jeanne neighborhood was a first in its day and now many of the homes retain the original charm they were built with. The thriving Uptown Business District, and Albuquerque’s two main shopping malls are the Northeast Heights. 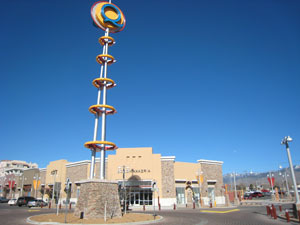 The new ABQ Uptown mixed-use Urban Community is in Albuquerque’s Northeast Heights as well. There is an upscale shopping area with restaurants in an outdoor mall setting. It is another great stop in the Northeast Heights. There are many things to do in the Northeast Heights of Albuquerque, besides shopping and eating. Expo New Mexico (a.k.a. The New Mexico State Fairgrounds) has a large chunk of Albuquerque Real Estate in this area and is a hub of activity. Including… The Downs at Albuquerque Racetrack and Casino, The Albuquerque Thunderbirds NBA development league, the open air Flea Market, and of course the New Mexico State Fair every September. There are some great parks in this part of Albuquerque as well, the highlight being the Los Altos Park. Los Altos features a skate park, baseball and softball fields, tennis courts, picnic areas, and the Los Altos municipal golf course. The eastern edge of the Northeast Heights borders the Albuquerque Foothills Open Space. This is a great place for a hike or mountain bike riding, and you can access the Sandia Mountain Wilderness area from here. The Northeast heights are centrally located within the Albuquerque Metro area so it’s quick to almost anywhere from this part of town. Northeast Heights Albuquerque includes the friendly communities of Albuquerque Meadows, Alta Monte, Alvarado Park, Bel-Air, Big Bend, Candelmen, Chelwood Vista, Cibola Addition, Eastrange – Piedra Vista, Cielito Lindo, Conchas Park, Crestview Heights, Eldorado Park, Eldorado Heights, Embudo Canyon, Enchanted Park, Fairgrounds, Fair Heights, Fair West, Glenwood Hills South, Casa Grande, Glenwood Hills, Hodgin, Hoffmantown, Holiday Park, Indian Moon, Inez, Jackson Area, Jerry Cline Park, Kachina Hills, La Mesa, La Sala Grande, Las Altos, Loma Del Rey, Manzano Manor, Mark Twain, Matheson Park, McKinley, Mesa Village, Montgomery Heights, Montgomery Park, Mossman, Near Heights, North Easterns, Northeast Heights, Onate, Princess Jeanne, Quail Ridge, Quigley Park, San Gabriel, Sandia High School Area, Sandia High School Area, Shadow Hills, Snow Heights, Sombra Del Monte, South Los Altos, Stardust Skies Park, Supper Rock, Towne Park, Uptown, Vista Del Mundo and Zuni. Remember, Northeast Heights Albuquerque is sometimes spelled as NE Heights, North East Heights, Northeast Albuquerque, or Near Northeast Heights. If you are searching for a home, house, homes for sale, houses for sale, real estate, townhouses, townhomes, lofts, land, acreage, lots for sale or investment property in Albuquerque, NM (New Mexico) you’ve come to the right place! Please browse through the links provided below to find the best home and house values in Northeast Heights Albuquerque (87107, 87110, 87112, 87111, 87109, 87123, 87108) or go to our easy to use Northeast Heights Albuquerque NM MLS Property Search Page.